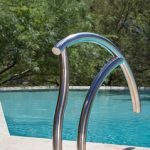 There is a wide variety of equipment available for your residential or commercial pool or spa that can make getting in and out of the pool not only easier, but safer. 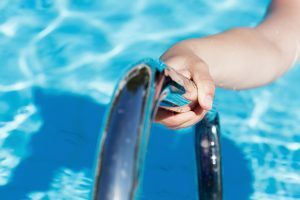 Climbing out of the side of a pool offers potential of injury and can create a potentially life threatening situation. 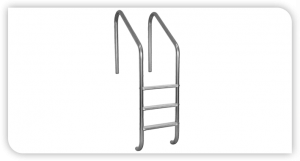 The addition of hand rails, ladders, and bars add a level of safety that reduces the risk of injury and increases the aesthetic value of your swimming pool. 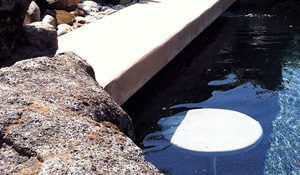 Giving your commercial swimming pool the safety and features expected of visitors, residents, and guests, means having standard safety equipment installed. 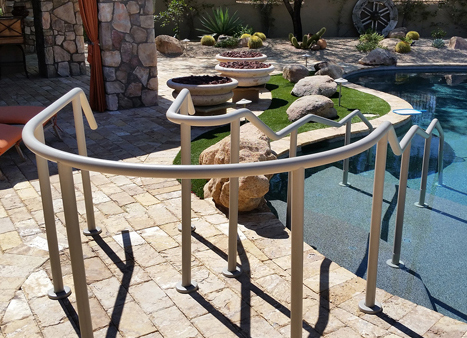 At Safe Defenses we offer a wide variety of handrails, grab bars, and stairs to give your pool the safety and completed look you desire. 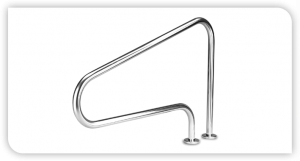 Whether you are looking for a standard handrail or one that is designed to impress, we have the options you need to achieve the look you desire. 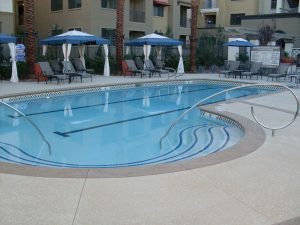 Our team has installed these rails and stairs at commercial swimming pools across the Las Vegas valley. 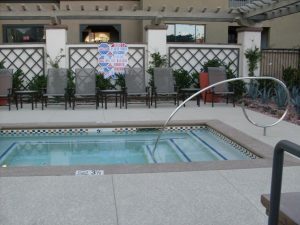 From apartment complexes to upscale pool clubs, homeowner association managed pools and even therapy pools, our experience will ensure your satisfaction. 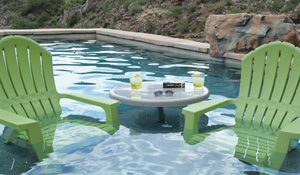 Getting out of deep water was never this easy. 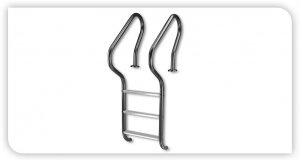 Available in a wide variety of finishes and colors, a swimming pool ladder makes it easy to get out of the side or deep end of your residential or commercial swimming pool. 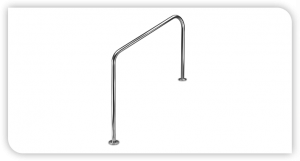 With so many styles and finish combinations to choose from, you are sure to love how function meets style. 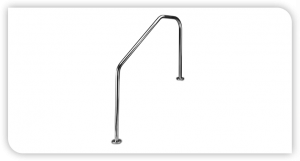 Your pool, spa or hot tub isn’t complete until you have a grab rail to brace while in the pool or help you get in or out. 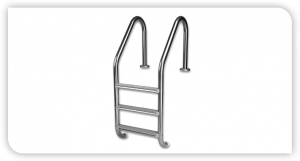 This swimming pool safety equipment is especially necessary for children and the elderly for sturdiness and to use as a guide. 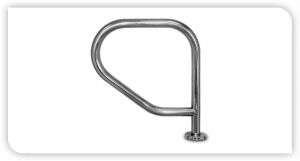 Once you install a hand rail from Safe Defenses you will only wonder why you didn’t do it sooner. 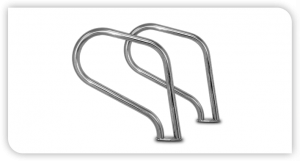 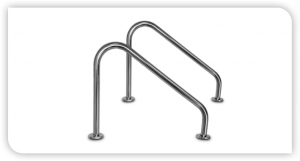 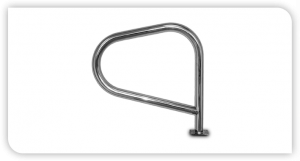 Available as individual rails, ideal for your spa, or in pairs, great for a swimming pool exit point, if you are considering grab rails, look no further than Safe Defenses. 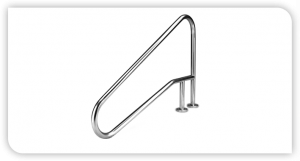 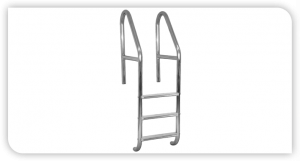 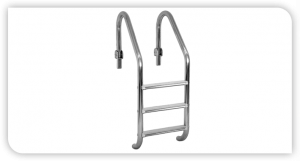 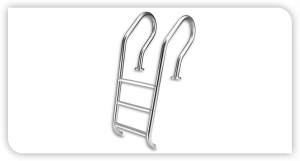 Our high quality swimming pool hand rails will help you and your loved ones get in and out of your pool with ease and in safety. 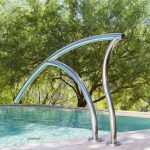 At Safe Defenses we offer a wide variety of designer swimming pool rail and stair options to give your swimming pool or spa the unique look you want. 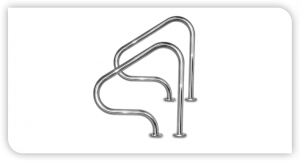 Each handrail comes in a stainless steel finish or can be upgraded to any of our six powder coat colors or three thermo plastic coated colors to match your outdoor décor. 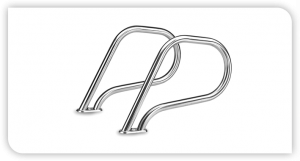 With so many options, we are sure you will find one you like. 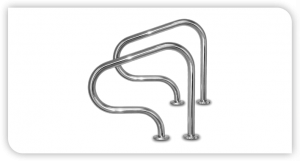 If you are looking something truly unique for your home or commercial swimming pool or spa, our team of expert handrail designers can create a custom rail to fit your exact specifications. 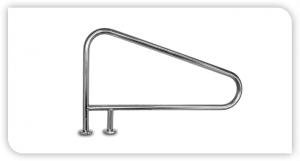 Your custom designed handrail can be built to the size, length and design you envision, without ever sacrificing safety. 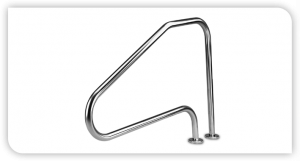 Rest assured that your custom swimming pool handrail will be built in the same durable and long lasting construction as our standard and designer handrails. 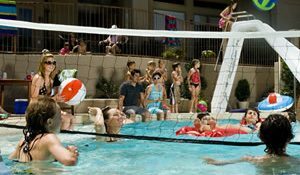 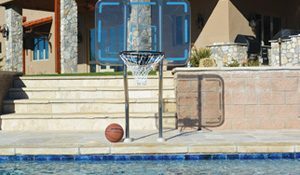 At Safe Defenses we offer a variety of specialty pool lifestyle and sports products to give you the most enjoyment out of your pool during the summer swim season. 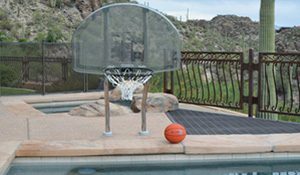 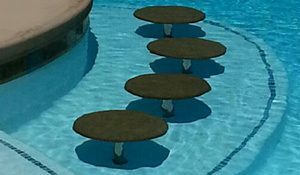 We can install specialty products into your swimming pool such as seating, pool spa tables, and a variety of professional style swimming pool sports equipment such as basketball and volleyball nets. 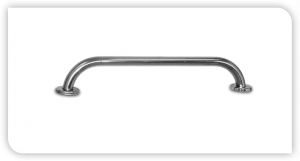 Each is available in a variety of colors and most can be easily removed without the use of tools.